This recipe is gluten free, dairy free, vegetarian, Slimming World and Weight Watchers friendly. Add the onion, zucchini and butternut squash and fry for 2-3 mins to soften. Add the garlic and ginger and fry for 1 more minute. Add the curry powder, Chinese five spice, tomato paste and soy sauce and stir to coat. Pour in the chicken stock, bring to a boil, then cover and simmer for 20 mins. Add sauce to a blender and blend until smooth. Set aside. Spray frying pan with spray oil, add chicken and fry for approx 5 mins until lightly browned. Remove and set aside. Spray frying pan again with spray oil, add the onion and green pepper and fry for 2 mins. Add back in chicken, pour in the sauce, stir to coat, add peas, bring to a boil, then cover and simmer for about 5 mins, till chicken is cooked through. 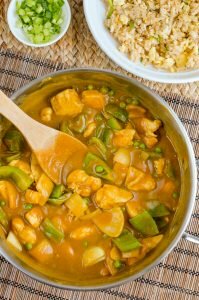 0 Response to "Syn Free Chinese Chicken Curry"